A cold climate is characterised by a combination of moisture and a temperature below -5°. 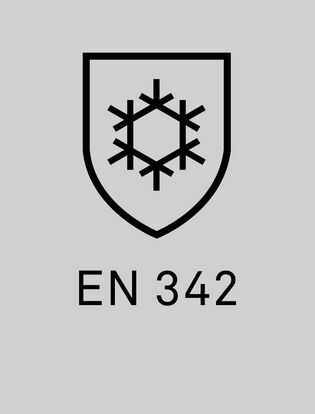 EN 342 indicates the value of the resulting effective thermal insulation for a wearer. It indicates the lowest temperature at which the body can maintain thermal neutral conditions indefinitely (8 hours) for light and medium duty tasks. It also indicates the lowest temperature at which body cooling is sustained at an acceptable level for 1 hour, while the wearer is performing light and medium duty tasks.